The sun has not come out for days...it has been cold here in Wisconsin and indoor recess is killing them! 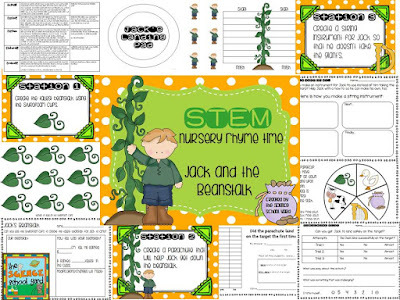 (and the teachers...) Time to pull out the fairy tale STEM packs to save the day! Here are some quick and easy ways to add fairy tale STEM to your lessons! Get a variety of fairy tale books that cover the theme you are trying to cover. For example, Jack and the Beanstalk. I use Epic Books for mine. It's a free site for teachers when you sign up. Tie it into what you are already doing. Using Jack and the Beanstalk can be used during a sound unit if you choose to make a harp. We make a harp/stringed instrument using cardboard and rubber bands. We cover pitch and vibrations and volume. 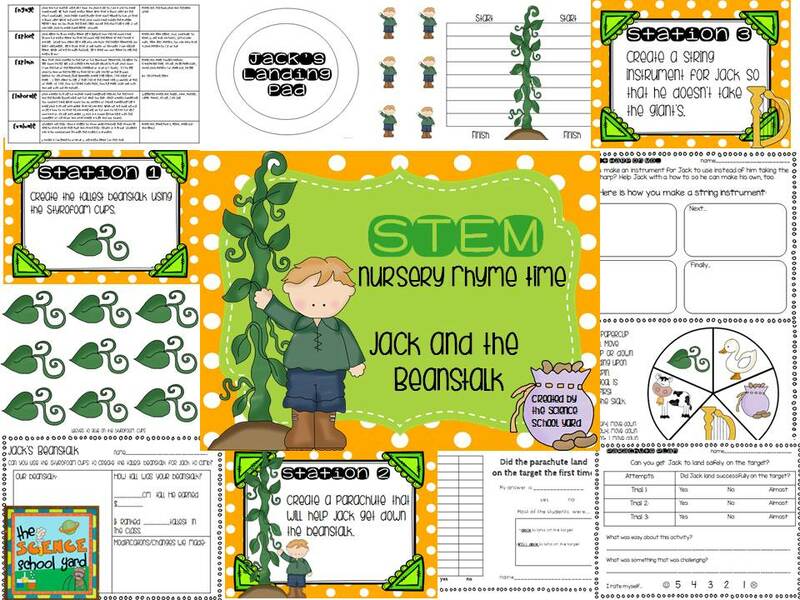 I also love to use Jack and the Beanstalk with my plant unit in spring. We grow beans in our school garden and add the STEM activity of how tall of a beanstalk can you build using just masking tape and green bulletin board paper. We add leaves and jack to the vine. You can also add activities such as building a parachute to get Jack safely to the ground. We use different types of materials to test to see which one has better air resistance. We set up a bull's eye for the parachutes to land on to see if Jack gets safely down. Add a twist...discuss how Jack did not do the right thing by taking something that didn't belong to him. Have them build a safe way for the giant to get down to get his harp and goose back. You can have them create the biggest giant out of a certain amount of paper and measure each of the giants and compare. This adds a little math to the equation. If you want to save yourself time...get these activities all in one place. Find the whole pack HERE. Bean there....done that and the kids loved it! Add a great version of Jack and the Beanstalk...a fractured fairy tale...a fun comparison and contrasting connection along with measuring how high each beanstalk is and you are set to go!